“We ask the voters to change to cast their votes. The present corrupt administration cannot be changed without the voter changing his and her attitudes. We ask the people to use this election to utilize people’s money without any corruption for development at local council level and to give a massive boost to the programme to build a new social system after the general election in 2020. There would be various instances and deployment of various gimmicks during the next few days to create chaos to disorientate the voter. 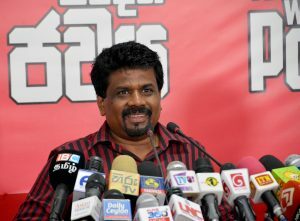 We ask the voter not to be deceived by such gimmicks but to maintain their stance and strengthen the JVP which is the only alternative for fraud, corruption and waste,” says the Leader of the JVP Anura Dissanayaka. 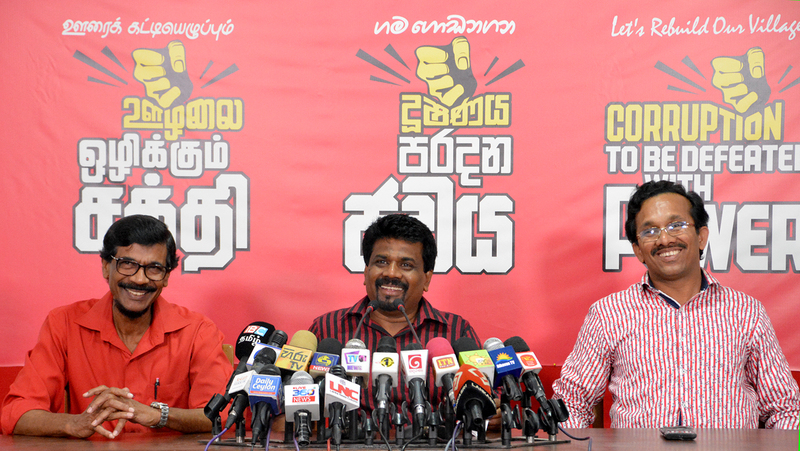 He said this addressing the media at a press conference held at the head office of the JVP at Pelawatta today (5th). Speaking further Mr. Dissanayaka said, “We have come to the final part of the local government election campaign. As the JVP we have won a considerable number of victories with the people. The present election is held under a system that reflects the standpoint of the masses instead of the distorted undemocratic system compiled with the manipulation of former Minister Basil Rajapaksa in 2012. We, as the JVP fulfilled a very special task in winning such a system for the masses in this country. This victory strengthened the democratic rights of the people. We came forward for this election to fulfil two goals. The first is to make the people aware of the role of local government councils that are connected with the most necessary requirements of the people which have been neglected by those groups who have ruled the councils until now. The task of maintaining maternity clinics, the road network of the local council, playgrounds, libraries as well as preserving and protecting the environment come under the local councils. However, we found that most of the citizens were not aware of these requirements. Now the public has a considerable awareness regarding this process. However, what local government councils have been doing until now is to maintain and re-maintain the roads belonging to the councils. This is done to earn a large amount of money through contracts. The JVP took the message to the people the importance of developing the local council to change this situation and make it the institute that utilizes the money earned as taxes, fines and allocations from the central government in a meaningful manner. Our second objective was to function with a vision to develop this country that has been economically, politically, socially and culturally dragged to the rock bottom. We used the local government election as a broad ideological struggle. It is evident that the country cannot be moved an inch along the path it has been taken throughout the last 70 years. As such, we used this election campaign as a process to get a boost to make the general election in 2020 as an election that brings a massive change to the country. We have carried out a special election campaign throughout the last 1 ½ months. We have put forward the biggest number of candidates for the election as a single party. For the first time in history, we have put forward lists of candidates for Jaffna MC, Eravur, Kanthankudy, Nallur local councils. We have also put forward our lists of candidates in a manner to promote national unity. We have also drawn the attention of the public to defeat fraud, corruption and waste that have become serious issues in the country and also taking legal action against the fraudsters and the corrupt. We used the slogan ‘Power to build the village and defeat corruption’ to make the people aware at local council level and to build power around it. Many other parties initially attempted to use other topics but all those slogans have been rejected and they too are making an unsuccessful attempt to pose as anti-corruption crusaders. Mr. Maithripala Sirisena wields his blunt sword and talks about opposition to corruption. Mr. Mahinda Rajapaksa says he would punish fraudsters once he comes to power. Mr. Ranil Wickremesinghe has no new topic to talk about. The ‘anti-corruption’ slogan raised by the JVP has been grabbed by the corrupt. Whatever they say about corruption before the election, the JVP will mediate to build a massive people’s movement after the election. We have already laid the foundation for this broad movement through this election. Mr. Mahinda Rajapaksa’s main slogan when he entered the fray was the division of the country. He also said he would become the Prime Minister after the election on the 10th. Now, he has changed his slogans. He doesn’t talk about becoming the Prime Minister nor does he speaks about the division of the country. We should say this. Any movement that attempts to divide the country would be defeated by the JVP. Mr. Mahinda Rajapaksa has exhausted his slogans. Mr. Ranil Wickremesinghe said he should be given the power to develop the village the ‘way he developed the country’. He says the party in power should be given power in the village as well. His party has been governing this country for three years. The country has been dragged to the brink of a precipice. Frauds and corruption have escalated in the country. If they are given the power in the village the village would be made a chew. Minister Lakshman Kiriella had threateningly said the local councils in which the UNP is not in power would not get any money from the central government. This is not Kiriella’s private assets. When Kiriella’s wife’s land at Balangoda was taken over by the Land Reform Commission, lands from Hantanne were taken as compensation. Also, he has Rs. 400 million in his fixed deposit account. When asked how he earned that money he said they were his fees for appearing in cases. We have never heard of a case he has won. However, funds are allocated to local councils not from his personal assets. It is from the central government. Just as we sent Mr. Rajapaksa home we would know how to get funds local councils. As such we ask people to bring the JVP to power to develop villages and towns. Mr. Maithripala Sirisena’s continuous lament is asking the people to vote to prevent his party from being divided. This election is not an affair of his party. The issues in the party should be solved by the party and its central committee. The statements the President makes at present seems to hinder his campaign. As such, all slogans of these parties have been exhausted. Also, their campaigns have become confusing. Now, they are looking for other slogans. Meanwhile, the slogan of the JVP has become popular and strong among the masses. The leaders of the UNP, the SLFP as well as the ‘bud’ encouraged frauds, corruption and waste and acted to break down the economy of the country. There is a huge gap between the aspirations of the members of these parties and eh goals of their leaders. It has been proved that frauds and corruption committed by these leaders amount to billions.